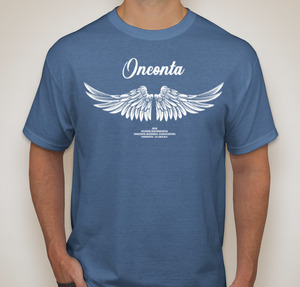 Buy An Angels in Oneonta T-Shirt! By making a donation to the Oneonta Business Association, you will receive an Angels in Oneonta T-Shirt to show your support and love for our hometown and wear throughout the year. The shirt design is the same as our mural located on Railroad Boulevard in Oneonta. The Angels in Oneonta shirt project will enable the Oneonta Business Association to accomplish similar projects and help with our events, including making our Festival of Lights Christmas events bigger and better! The OBA is a non-profit 501 (c) (6) organization supported by membership dues, the City of Oneonta, a grant from the Alabama Department of Tourism, and private donations. Shirts are available for all ages, from newborn to adults. They are short-sleeved, 50% poly/50% cotton, denim blue in color, and great quality. Just use the appropriate PayPal portal below to order according to adult, youth, and children's sizes. Since the portals are separate for each size group, you will need to order accordingly. PayPal will only allow so many items per button. NEW! Sweatshirts are now available for $25 on special order. A limited number of shirts are available for purchase at DD's Place, 301 1st Avenue East, in Oneonta. For online orders, we have to get a minimum of 12 shirt orders to have them printed. Often, we are able to fill an order from the stock at DD's Place. In order to save money, donors will be notified when their shirts are available for pick up from DD's Place (OBA member), located at 301 First Avenue East in Oneonta. Phone number there is 205-446-7729. We will not be shipping t-shirts to people who live locally. If you prefer to mail in your t-shirt donation, please click here to utilize a form and mail your check, payable to the OBA. If you live outside Blount County and wish for your shirt(s) to be shipped, we can do that for a nominal fee. Just email us at info@oneontabusinessassociation.com to make arrangements. We appreciate working with OBA member Lollipops Printing on this project! Thank you, Tammy and Mike.